We are back in Farmville! 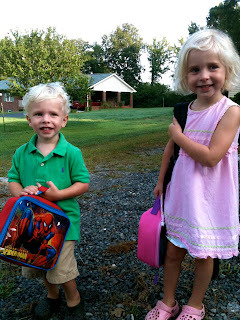 Caroline and Tucker have successfully completed their first week of school. 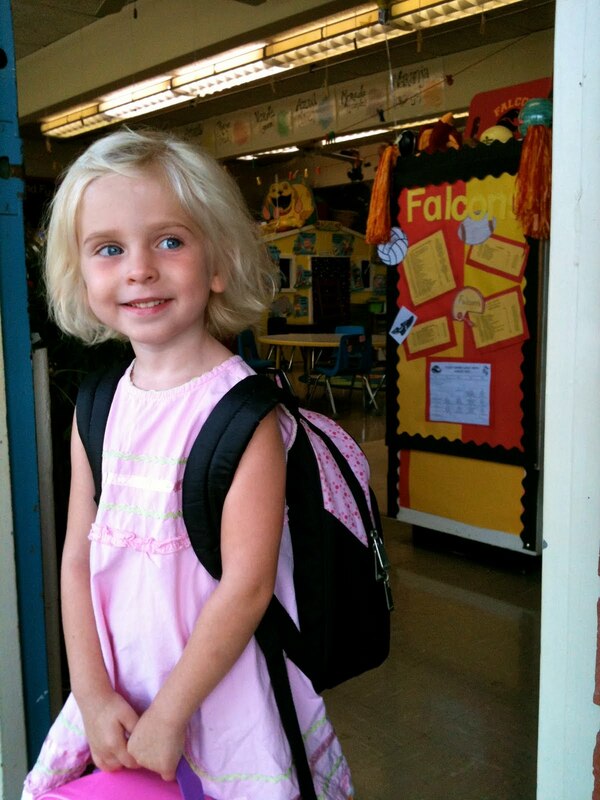 Caroline is in a 3 and 4 year old Pre-K program and loving every minute! Although she didn't have to be at school until 8:30 on Monday morning, she was up at 7:15, dressed and ready to go! I asked her to come sit down and have breakfast and she said "No Mom, I have to go to school." Thankfully she had plenty of time to spare. Once we got to the school and out of the car, she looked around and said "Mom there are big kids here!" (This means 4th and 5th graders.) Chad, Tucker and I walked her to her classroom and she didn't look back. In fact, she saw so many fun, new things to play with that when we tried to hug and kiss her goodbye she gave us each about 2 seconds and then she was off! I think Chad and I were a little teary eyed, but there was no doubt that she was in the right place! And for Tucker...He loves his "bit boy school" too! On Monday we took him to school after we dropped Caroline off. He was a little pouty and when I asked him if he was sad to leave Caroline he said "yes." Once we got to his new classroom, he was just fine. He seemed a little more hesitant than his sister, but his teacher said he had a great day. He played with construction, ate all of his lunch and went down for a nap easily and slept for 2 hours. Sounds like a good day to me! On Tuesday, I began working at Tucker's pre-school. I am now the lead teacher in his class and have 8 two year old kids to keep up with. It is fun for me to see Tucker on his own and not following behind or being bossed around by big sister. He is great at cleaning up! He is the oldest in his class by a few months. Tucker has learned well from Caroline and acts like he has 7 younger siblings when at school. He is caring, thoughtful and does a great job using his words when there is a confrontation. I am so, so proud of my two little ones! They have had a lot of change in the past few months, but have handled it like champs. It is so great to see them so joyful and genuinely happy with their new home and new schools. I think I'll keep'em!!! So glad you are "blogging" again. Love the pictures. Keep them coming! Ditto for me too, Mary! I have been on blog withdrawal not hearing their updates in print! I am so thankful that the kids really like their schools.